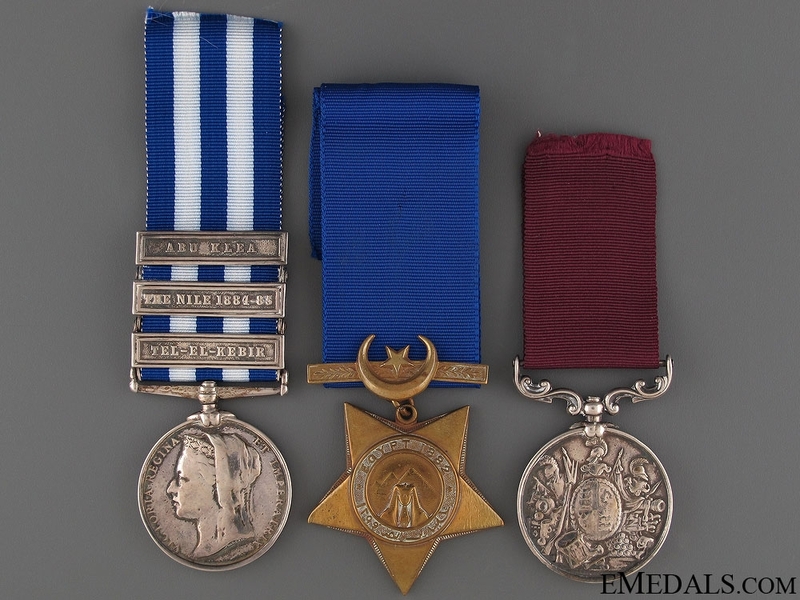 Private A.S. Albett, Royal Horse Guards: Egypt Medal, 3 Clasps - TEL-EL-KEBIR, THE NILE 1884-85, ABU KLEA (871 Pte A.S. ABLETT. R.H. Gds. 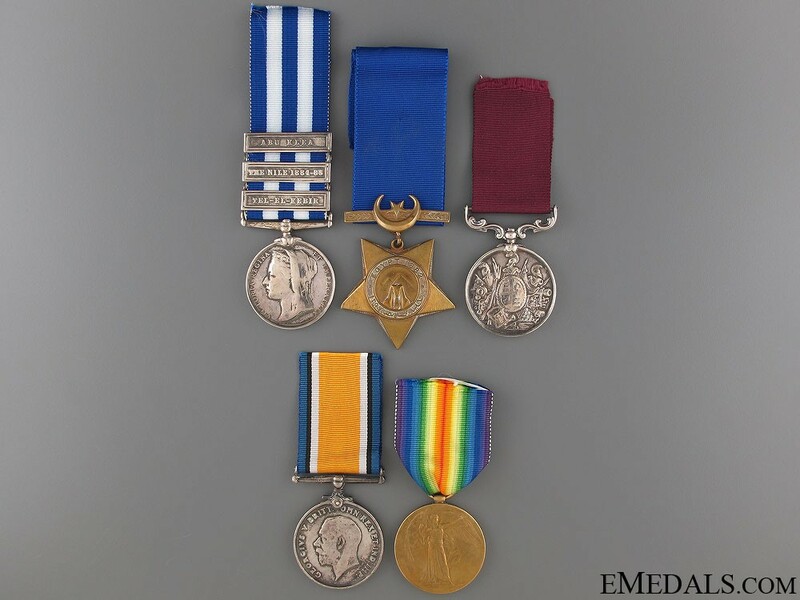 ); Khedive's Star (unnamed); and Army Long Service and Good Conduct Medal (871. PTE. A.S. ABLETT. R: H: GDS.). 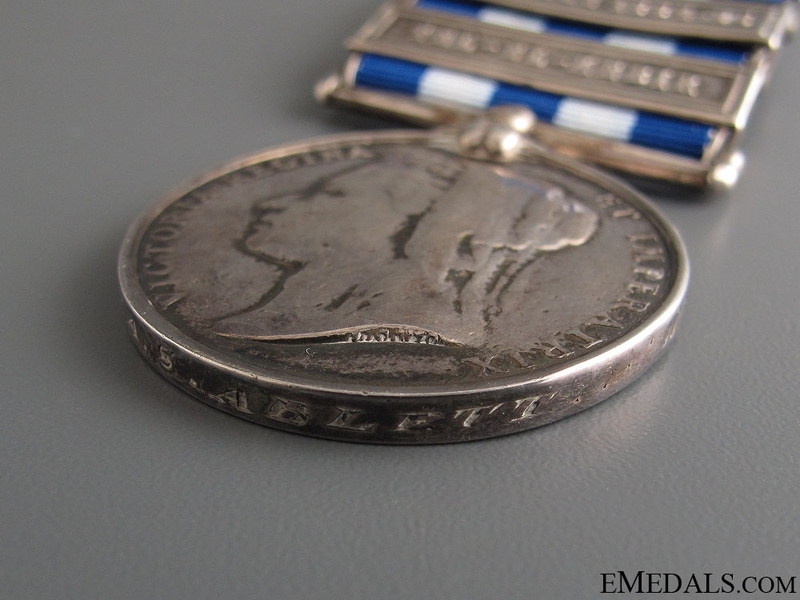 Naming is officially engraved in italics on the Egypt Medal and in capitals on the ALSGCM. 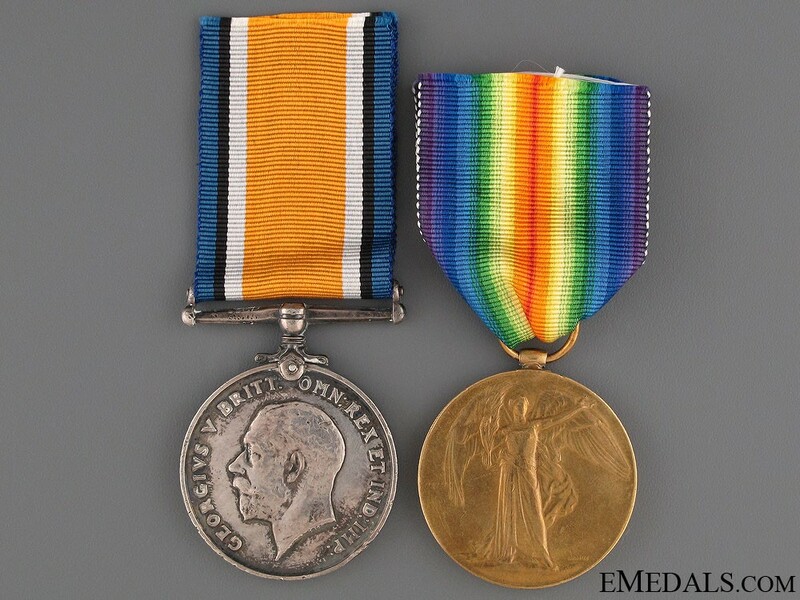 Sergeant Alfred A. Albett: British War Medal (201001 SJT. A.A. ABLETT. C.A.G.S. 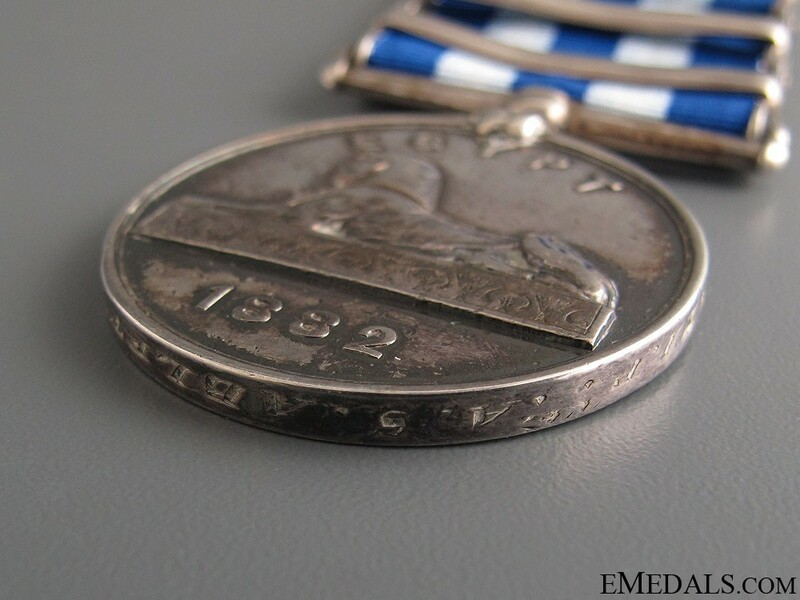 ); and Victory Medal (201001 SJT. A.A. ALBETT. C.A.G.S). Naming is officially impressed. 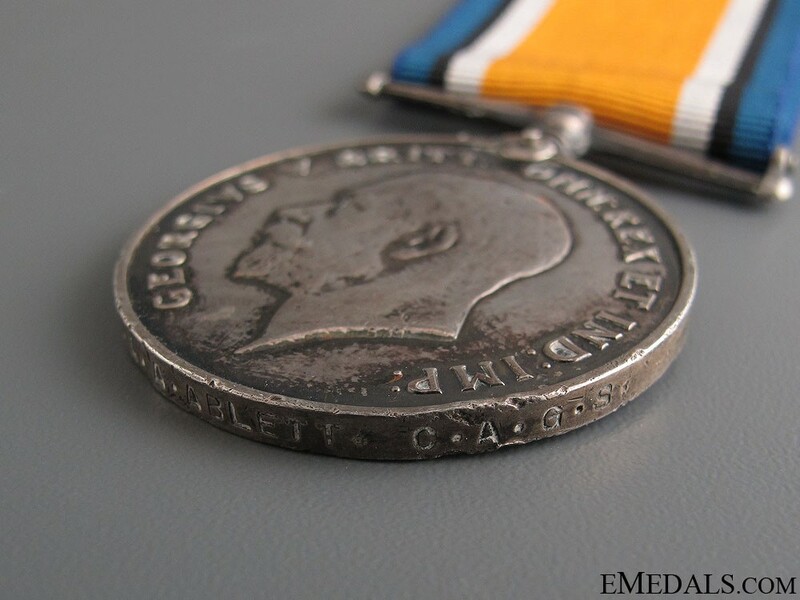 All medals are unmounted, cleaned, light contact, very fine. Accompanied by a CD containing fifteen pages with copies of WWI Sergeant Alfred A. Albett's Index Cards, Attestation Paper, Service Records and Discharge Certificates. Both soldiers are related to Alfred Ablett, VC DCM, 3rd Battalion, Grenadier Guards. Footnote: Alfred Alma Albett was born December 23, 1893 in London, England, the son of Alma Saint Albett and Blanche Albett. He signed his Attestation Paper on October 28, 1915 at the Toronto Recruiting Station with the 95th Infantry Battalion (Queen's Own Rifles), in Toronto, Ontario, at the age of 21, naming his next-of-kin as his mother, Blanche of Eton, Buckinghamshire, England (later changed to his Wife, Ada Albett of Toronto), stating that he had no previous military service, that he was not married (later changed to married) and that his trade as that of Racquets Professional. He and his wife had no children at the time of enlistment. 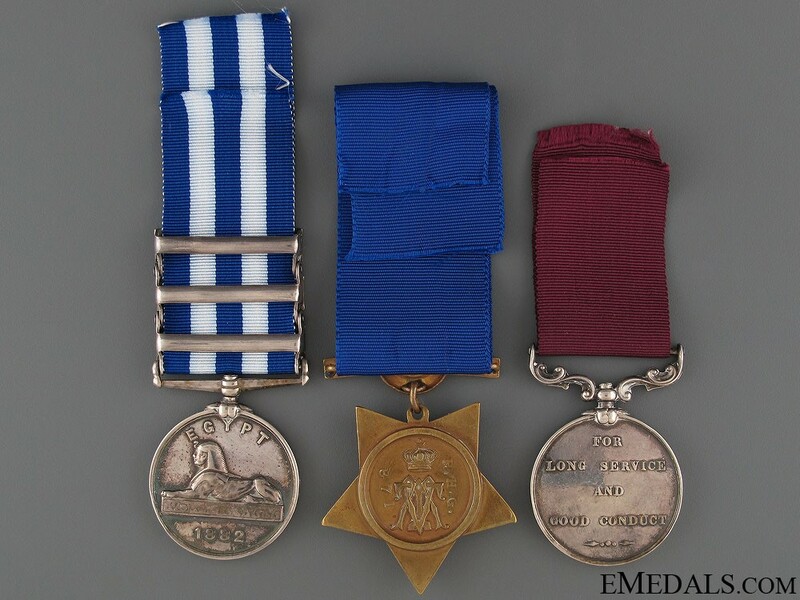 The Battalion was raised and mobilized in Toronto under the command of Lieutenant-Colonel R.K. Barker with a strength of 36 officers and 1,061 other ranks, sailing May 31, 1916 from Halifax, Nova Scotia, aboard the S.S. Olympic, arriving in England on June 8th. Upon his arrival with the 95th Infantry Battalion in England, he was named Acting Corporal at Lower Dibgate on June 8th. The following month, he was transferred to the Canadian Army Gymnastics Staff on July 1st. He was named Acting Sergeant on September 15, 1916, then struck off strength to the Garrison Gymnasium at Seaford on October 30th. He was again transferred the following month, to the Physical Training & Body Fitness School and attached to Headquarters at Shorncliffe on November 16th. His time attached to headquarters was a short one, as he ceased to be attached to the Physical Training & Body Fitness School on proceeding overseas to the French theatre on December 13, 1916, taken on strength in the field on the 14th. He was taken on strength of the Canadian General List and placed with the 5th Reserve Battalion. 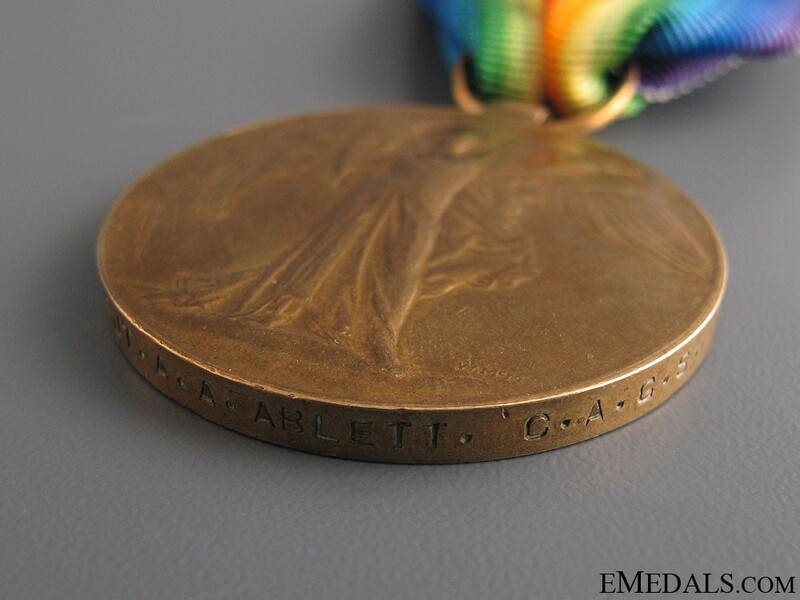 As a member of the Canadian Army Gymnastics Staff, Albett was promoted to Sergeant on January 20, 1918 and is documented as being at the Canadian Corps Reinforcement Camp "as in W.E." on February 22nd. He was admitted to hospital on April 4, 1918 with an undisclosed illness and discharged on the 8th. He is also documented as having served with the 85th Infantry Battalion "Nova Scotia Highlanders" as a Staff Sergeant, but his tern with them is undetermined. Upon the ceasing of hostilities, and still with the Canadian Army Gymnastics Staff, he proceeded to England and was posted to the General Depot at Bramshott on May 4, 1919, where he was struck off strength of the Overseas Military Forces of Canada on proceeding to Canada on May 31st. Albett sailed from Liverpool, Engalnd aboard the H.M.T. Adriatic, arriving in Halifax on June 7th and posted to Dispersal Station "B". He was discharged upon demobilization at Dispersal Station "B", Military District No. 6 in Halifax on June 15, 1919, entitled to wear the War Service Badge, Class "A", number 325725 and receiving a War Gratuity of $530.00. 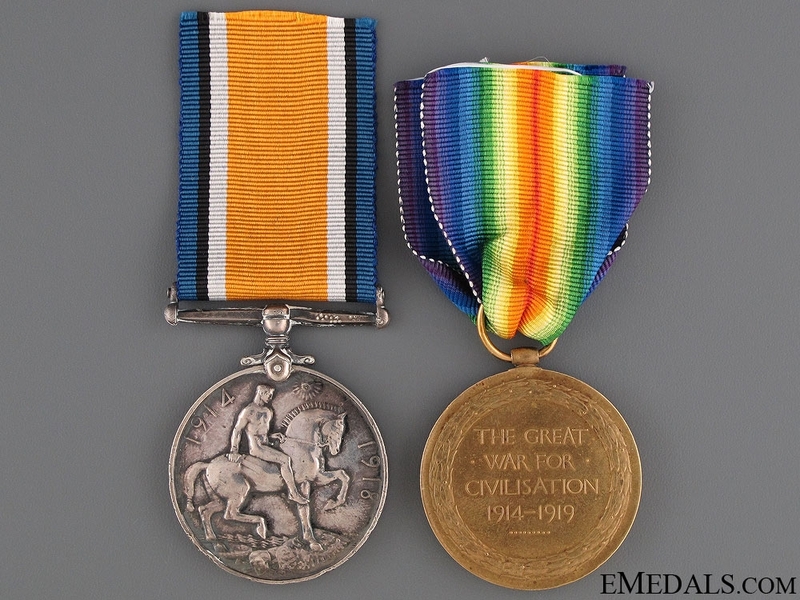 Footnote: A relative of the recipients of the above two medal groups was Alfred Ablett VC DCM. He was born on August 3, 1830 at Weybread, Suffolk, England, the sixth of nine children of Samuel Albett and Elizabeth Albett (nee Crockford). He joined the joined the Grenadier Guards and saw action in the Crimea War as a Private. 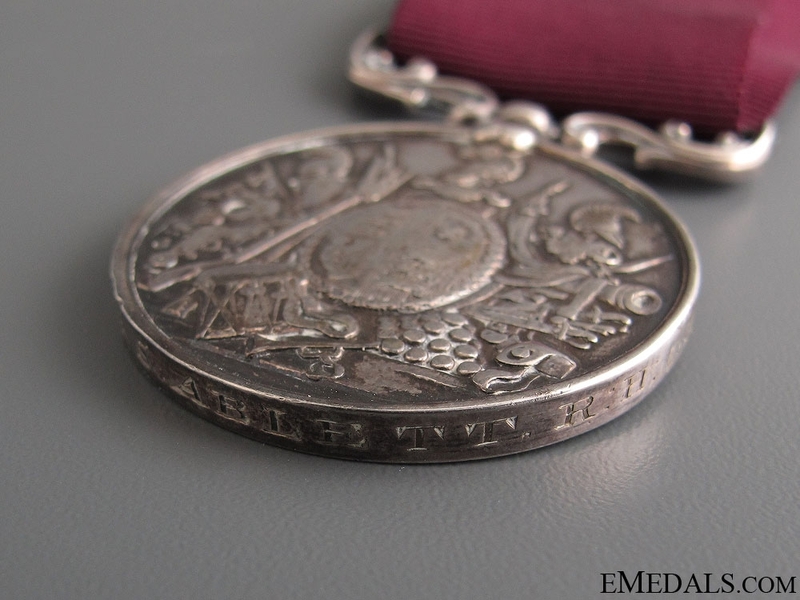 On September 2, 1855, with the 3rd Battalion, Grenadier Guards, at the age of 25, he was fighting in a trench at the siege of Sevastopol when a shell fell among cases of ammunition and powder. At once, Albett seized the shell and threw it out of the trench before it exploded amongst the men. He was awarded the Victoria Cross, his citation appearing in the London Gazette on February 24, 1857: "On 2 September 1855 during the siege if Sebastopol, Crimea, a burning shell fell into a trench containing two cases of ammunition. Private Albett at once realising the danger to which all were exposed, seized the shell in his hands and threw it over the parapet, where it immediately exploded as it touched the ground, but not a man was touched." He eventually reached the rank of Sergeant with the Grenadier Guards and upon the termination of his military service, he joined the Police and became an Inspector at Millwall Docks in London. He also resided in the London area with his wife and four children. Albett died at the age of 66, on March 12, 1897 at Poplar, East London and was buried in his home parish of Weybread. The London Standard carried a tribute in its edition of Saturday, March 30, 1897: "At Weybread, Suffolk, on Thursday, (18th March) were interred the remains of the late Sergeant Ablett, one of the earliest recipients of the Victoria Cross, which he gained whilst serving in the Grenadier Guards in the Crimea. The Rev. H. S. Oriel, vicar, conducted the service, and four Sergeants of the Guards from London acted as pall-bearers. On the coffin were wreaths sent by the 3rd Battalion Grenadiers." His Victoria Cross was donated and is on display at the Grenadier Guards Regimental Headquarters, Wellington Barracks, London, England.